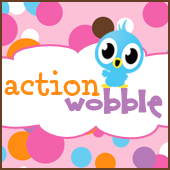 Action Wobbles: Action Wobble: Catch A Falling Star! It is Gloria from Girlia's Cards and it is that time again to post another fun action wobble card. This time I thought I would use stars. Those faces on those stars just makes them adorable and when the bigger star is set in motion with an action wobble...well, you be the judge. Theresa the Scrapbooking Queen is ready to place your order at the Royal Castle Shoppe. If you stop by there you will find action wobble and anything your card making, scrapbooking heart desires. Also remember that the Action Wobble Design Team posts everyday so be sure to visit the Action Wobble DT blog. Also if you need a little challenge in your life then feel free to join Wobble Wednesdays Challenge blog and enjoy the different variety of card images in motion. Its fun, so join in.